Found only within a small area in western Montana along the Idaho border, little information exists to assess threats. The intrinsic vulnerability and specific habitat requirements of this species in combination with a small known range make declines or extirpation within the state a concern. ScoreU - Unknown. Short-term trend in population, range, area occupied, and number and condition of occurrences unknown. ImmediacyLow - Threat is likely to be operational within 5-20 years. ScoreA - Very Narrow. Specialist. Specific habitat(s), substrate(s), food type(s), hosts, breeding/nonbreeding microhabitats, or other abiotic and/or biotic factor(s) are used or required by the Element in the area of interest, with these habitat(s) and/or other requirements furthermore being scarce within the generalized range of the species within the area of interest, and, the population (or the number of breeding attempts) expected to decline significantly if any of these key requirements become unavailable. Adults have light or tan bronze marbling on a dark brown or black background. They are heavy-bodied, with a large head and muscular legs; body length varies from 3.5 to 8 inches. Larvae are identified by their short, bushy, external gills, their large size, a dorsal fin starting at or behind the rear limbs, and their stream habitat. Other larval salamanders found in Montana live in ponds, have long, feathery gills, and a dorsal fin originating far forward of the rear legs. No other salamander will be found as an inhabitant of streams in Montana. Eggs are somewhat oblong, large (20-30 mm), and attached on a short pedicle to the substrate in moving water. Terrestrial adults of Long-toed and Tiger Salamanders are much smaller; adult Idaho Giant Salamanders reach a total length up to 340 mm, or 3-4 times that of other salamander species in Montana. Known to occur up to 2160 m in elevation (Nussbaum et al. 1983). Transformed adults, although seldom seen, inhabit moist coniferous forests where they may be found under logs, bark, or rocks. They are most active on warm, rainy nights. Larvae are usually found in swift, cold mountain streams, but may occasionally be found in lakes or ponds (Reichel and Flath 1995). Larval diet is influenced by size, consisting of 52% Trichoptera larvae, 46% Plecoptera nymphs, 30% Coleoptera larvae, 28% Ephemeroptera nymphs/Coleoptera adults. Ascaphus larvae (14%) may be important food for larger larvae (Metter 1963). Females do not feed during 7 months spent in nest with eggs (Nussbaum et al. 1983). Neoteny uncommon in small streams, but neotenes may constitute major breeding force of populations in large streams and ponds/lakes (Nussbaum and Clothier 1973). Ovipost occurs in spring (May in coastal regions) and fall (noted in Idaho); incubation last 275 days (Nussbaum 1969). Larvae hatch at snout-vent length (SVL) 18.25 mm, but do not feed for 3 to 4 more months until they are 24.43 SVL. Metamorphose occurs during the second year (Nussbaum and Clothier 1973). Females do not feed during the 7 months spent in nest with eggs; therefore, they likely only breed during alternate years (Nussbaum et al. 1983). Potential threats for the species across its global range probably apply also to Montana populations. Population declines or extinctions have not yet been documented, in part because the species was documented in Montana only once prior to 2005. All records are from headwaters streams and lake outlets in Mineral County. Range likely reduced during the last century from logging of mature and old-growth forest types, wildland fire, road building, and placer mining.The species is more likely to occur in road-less areas (Sepulveda and Lowe 2009), so changes in land use over the last century have undoubtedly impacted this species. Routine monitoring of known populations should be conducted to identify threats to each, as well as to determine their continued viability. Additonal stream surveys are desirable to determine connectivity with adjacent Idaho populations, especially between Thompson Falls and Lolo Pass (Maxell et al. 2009). Maxell, B.A., P. Hendricks, M.T. Gates, and S. Lenard. 2009. 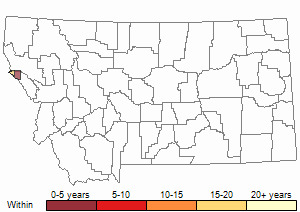 Montana amphibian and reptile status assessment, literature review, and conservation plan, June 2009. Montana Natural Heritage Program. Helena, MT. 643 p.
Metter, D.E. 1963. Stomach contents of Idaho larval Dicamptodon. Copeia (2): 435-436. Nussbaum, R .A. and G. W. Clothier. 1973. Population structure, growth, and size of larval Dicamptodon ensatus (Eschscholtz). Northwest Science 47(4): 218-227. Nussbaum, R.A. 1969. Nests and eggs of the Pacific giant salamander Dicamptodon ensatus (Eschscholtz). Herpetologica 25: 257-262. Sepulveda, A.J. and W.H. Lowe. 2009. 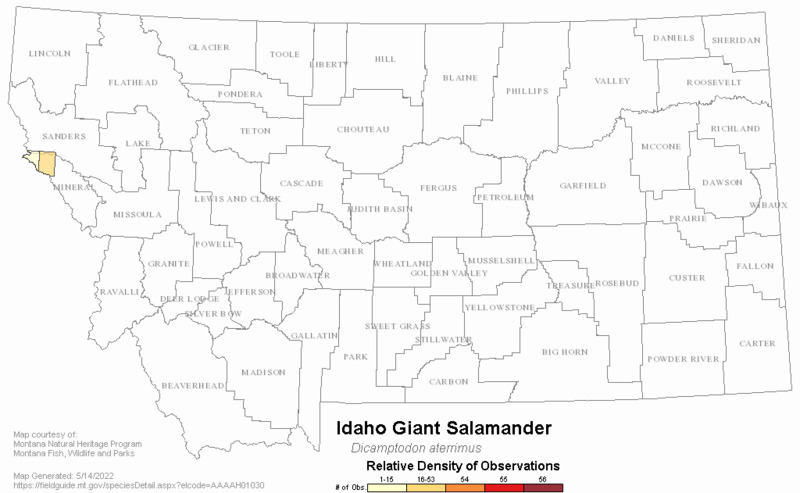 Local and Landscape-Scale Influences on the Occurrence and Density of Dicamptodon aterrimus, the Idaho Giant Salamander. Journal of Herpetology 43(3), 469-484. Anderson, J.D. 1969. Dicamptodon and D. ensatus. Catalogue of American Amphibians and Reptiles. Pp. 76.1-76.2. Antonelli, A.L., R.A. Nussbaum and S.D. Smith. 1972. Comparative food habits of four species of stream-dwelling vertebrates (Dicamptodon ensatus, D. copei, Cottus tenius, Salmo gairdnei) Northwest Science 46: 277-289. Blaustein, A.R., J.J. Beatty, H. Deanna, and R.M. Storm. 1995. The biology of amphibians and reptiles in old-growth forests in the Pacific Northwest. General Technical Report PNW-GTR-337. Portland, OR: U.S. Department of Agriculture, Forest Service, Pacific Northwest Research Station. 98 p.
Bury, R.B. 1972. Small mammals and other prey in the diet of the Pacific Giant salamander (Dicamptodon ensatus). American Midland Naturalist 87(2): 524-526. Cassirer, E.F. 1995. Wildlife inventory, Craig Mountain, Idaho. Idaho Department of Fish and Game, Lewiston Idaho. 182 pp. Cochran, D.C. 1961. Type specimens of reptiles and amphibians in the United States National Museum. U.S. National Museum Bulletin (220) xv + 291pp. Connor, E.J., W.J. Trush, and A.W. Knight. 1988. Effects of logging on Pacific giant salamanders: influence of age-class composition and habitat complexity. Bulletin of the Ecological Society of America 69 (Suppl. ): 104-105. Cope, E.D. 1867. A review of the species of the Amblystomidae. Proceedings of the Academy of Natural Sciences of Philadelphia 19: 166-211. Cope, E.D. 1867. Proceedings of the Academy of National Sciences, Philadelphia, Volume 19, 2nd Series, p. 201. Daugherty, C.H. and F.W. Allendorf. 1977b. The taxonomic value of genetic distance: data from two amphibians. Abstract. American Zoologist 17(4): 973. Daugherty, C.H., F.W. Allendorf, W.W. Dunlap and K.L. Knudsen. 1983. Systematic implications of geographic patterns of genetic variation in the genus Dicamptodon. Copeia 1983: 679-691. Dethlefson, E.S. 1948. A subterranean nest of the Pacific giant salamander, Dicamptodon ensatus (Eschscholtz). Wasmann Collector 7: 81-84. Franz, R. 1970a. Additional notes on the feeding of larval giant salamanders, Dicamptodon ensatus. Bulletin of the Maryland Herpetological Society 6(3): 51-52. Good, D.A. 1989. Hybridization and cryptic species in Dicamptodon Caudata Dicamptodontidae. Evolution 43(4): 728-744. Kelsey, K.A. 1994. Responses of headwater stream amphibians to forest practices in western Washington. Northwest Science 68(2): 133. Kessel, E.L. and B.B. Kessel. 1943a. 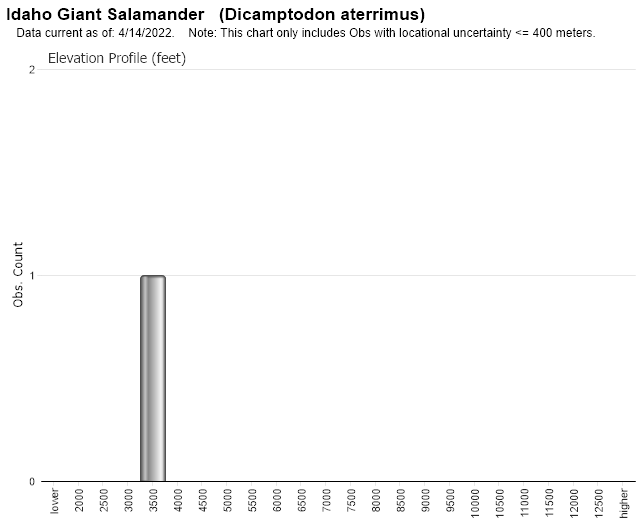 The rate of growth of older larvae of the Pacific giant salamander, Dicamptodon ensatus (Eschscholtz). Wasmann Collector 5: 141-142. Kessel, E.L. and B.B. Kessel. 1943b. The rate of growth of the young larvae of the Pacific Giant Salamander, Dicamptodon ensatus (Eschscholtz). Wasmann Collector 5: 108-111. Kessel, E.L. and B.B. Kessel. 1944. Metamorphosis of the Pacific giant salamander, Dicamptodon ensatus (Eschscholtz). Wasmann Collector 6: 38-48. Lind, A.J. and H.H. Welsh, Jr. 1990. Predation by Thamnophis couchii on Dicamptodon ensatus. Journal of Herpetology 24(1): 104-106. Maughan, O.E., M.G. Wickham, P. Laumeyer and R.L. Wallace. 1976. Records of the Pacific Giant Salamander, Dicamptodon ensatus, (Amphibia, Urodela, Ambystomatidae) from the Rocky Mountains in Idaho. Journal of Herpetology 10(3): 249-251. Maxell, B.A. 2009. 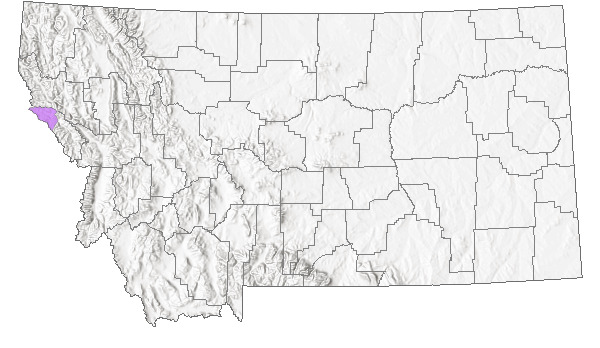 State-wide assessment of status, predicted distribution, and landscapelevel habitat suitability of amphibians and reptiles in Montana. Ph.D. Dissertation. Missoula, MT: Wildlife Biology Program, University of Montana. 294 p.
Nussbaum, R.A. 1972. Systematics of the salamander genus Dicamptodon Strauch (Amphibia: Caudata: Ambystomatidae). Ph.D. Dissertation. Oregon State University, Corvallis, OR. 226 p.
Nussbaum, R.A. 1976. Geographic variation and systematics of the salamanders of the genus Dicamptodon Strauch (Ambystomatidae). Museum of Zoology, University of Michigan Miscellaneous Publication Number 149. 94 pp. Reed, C.A. 1949. The problem of metamorphosis in the western marbled salamander Dicamptodon ensatus. Copeia 1949: 81. Savage, J.M. 1952. The distribution of the Pacific giant salamander, Dicamptodon ensatus, east of the Cascade Mountains. Copeia 1952: 183. Welsh, H.H., Jr. 1986a. Dicamptodon ensatus (Pacific Giant Salamander). Behavior. Herpetological Review 17(1): 19. Welsh, H.H., Jr. 1986b. Life history notes. Caudata. Dicamptodon ensatus (Pacific giant salamander). Herpetological Review 17(1): 19. Web Search Engines for Articles on "Idaho Giant Salamander"